3. Group pic and run start at 6:30 sharp! 6. Free dinner for all runners after the run! 7. $3 select Colorado craft beer all night with runner hand stamp! We begin at Blackbird (305 S Downing St). Run east on the sidewalk of Alameda to Marion Parkway and head south into Wash Park. You may run in either direction around the park and return on Marion to Alameda, than back to Blackbird. Runners are encouraged to ride their bikes or run to Blackbird on Wednesdays. Street parking is available on Marion Parkway. While on the run, please stay on the sidewalk or street. Do not cut any corners across any residential grass. We are starting a fresh new database to count runs for this season. 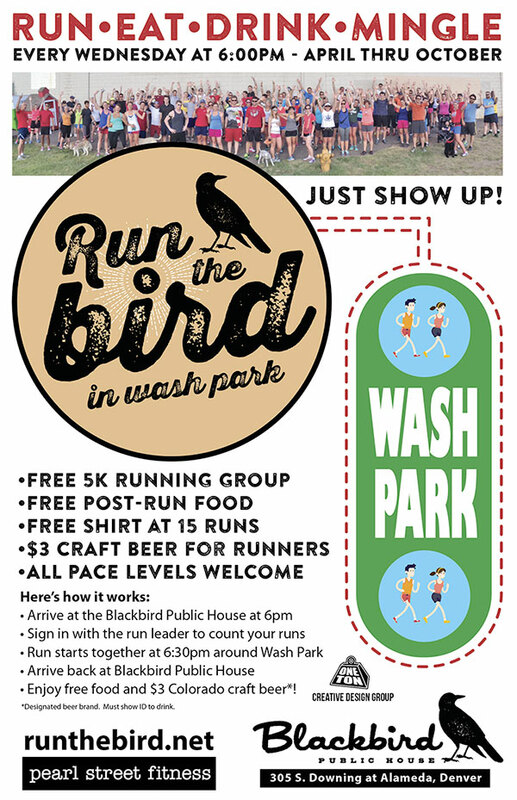 Every runner will need to fill out the ONE-TIME registration on the iPad at Blackbird… even if you have run with us in past seasons. Sign up to hear about upcoming events and other updates!